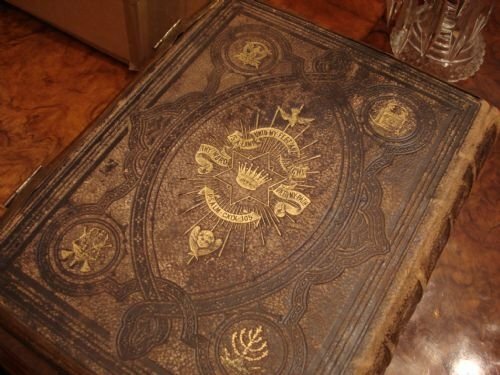 A wonderful and rare 1901 Moroccan leather bound Book of Common Prayer and Hymns, made in a very limited number of copies for Queen Victoria's funeral, and contained in a fitted leather and silver case, as well as the original presentation box. A very rare Moroccan leather copy of the Book of Common Prayer, Psalms of David, and Hymns Ancient and Modern, made to be used in all churches and chapels in England and Wales, and the town of Berwick-Upon-Tweed, to honour Queen Victoria on her funeral day on January 21, 1901. Berwick-Upon-Tweed is the northernmost town in England, and its famous arched railway viaduct, the Royal Border Bridge, was opened by the Queen in 1850. Queen Victoria was the very popular and beloved Queen of England for 63 years and Empress of India. 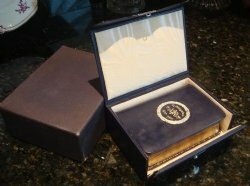 This book comes with both the original leather and solid silver hallmarked exterior case, as well as the original presentation box. Only 500 were made, and this is number 20, a wonderful and complete survivor. It included the special forms of service. 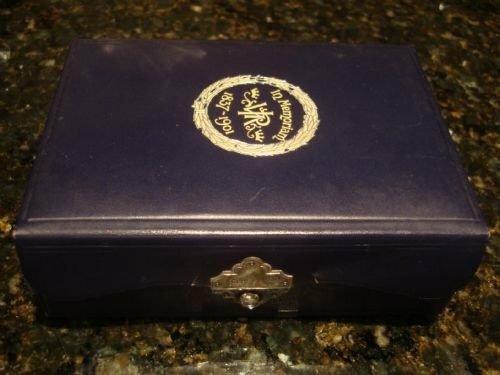 The dark blue Moroccan leather case bears an embroidered plaque that says "In Memoriam 1837-1901," and the Royal cypher. It is surrounded by a wreath of laurel leaves. It is lined in cream coloured moire silk, and has a beautifully shaped English hallmarked solid silver fully hallmarked button operated clasp, hallmarked Birmingham 1900, and made by Charles Penny Brown, and the leather cover closure is similarly shaped. There are two small marks to the leather on either side of the clasp. 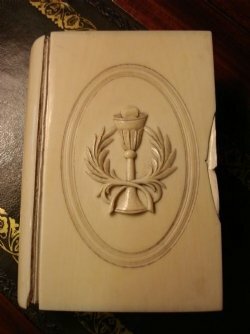 Inside is found the similar Moroccan leather bound Book of Common Prayer and the Administration of Sacraments, and the Psalms of David as well as the complete edition of Hymns Ancient and Modern. The end pages are dark blue moire silk and the leather is gilt embossed to the interior edges. The paper edges are beautifully gilt when viewed on the right, but when turned to the left are purple, the royal colours. 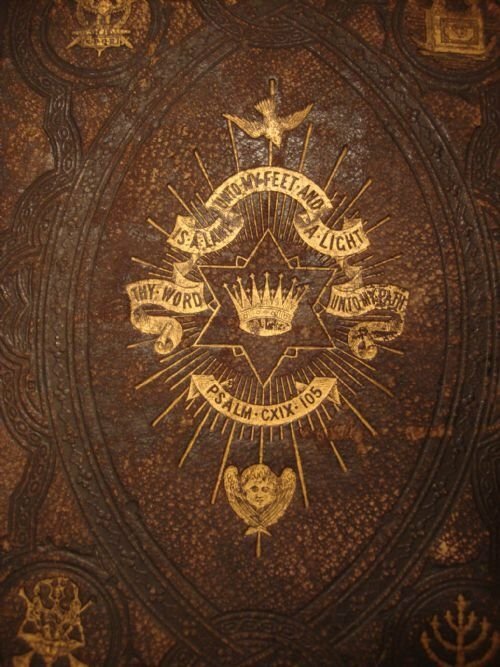 The same plaque is found on the front cover as is on the leather case, and the title is embossed in gold on the spine. There are also two silk ribbon page markers. 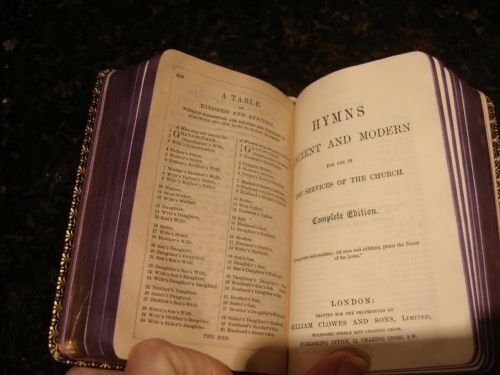 The Book of Common Prayer was published in London by Eyre and Spottiswoode, while The Book of Hymns Ancient and Modern, was published in London by William Clowes and Sons. The presentation box is covered with paper and lined with baize, and has a split to one corner. Size-case 4 inches wide by 5.5 inches long by 2 inches deep. Book-3 3/8 inches wide by 5 1/8 inches long by 1.25 inches deep. Exterior box-4.75 inches wide by 6.25 inches long by 2.25 inches deep. This is a very rare thing, and in very good condition, having been kept within the presentation box, and then within the leather case for over 100 years, and having had only gentle use. 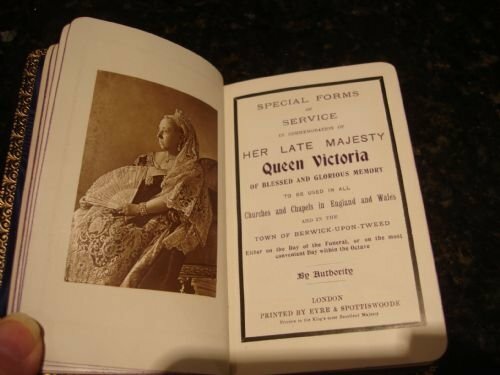 A wonderful item for the collector of bibles and religious books, or Queen Victoria memorabilia. I have never seen another. Please ask if you would like additional photos. Circa 1890 English antique leather and brass bound family bible by John Eadie. 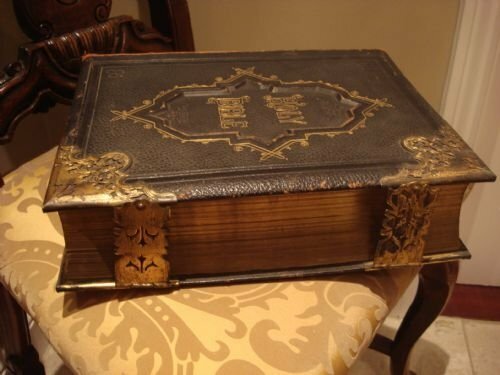 A very ornately bound copy of the "Holy Bible: The National Comprehensive Family Bible, with the commentaries of Scott and Henry, and containing also many thousand critical and explanatory notes selected from the great authors of Europe and America. The commentaries condensed, and the whole edited by the late Rev. John Eadie, D.D., LL.D." Published by Henry Williams & Co. of Stroud Green N.
A large heavy embossed and gilded English full leather bound family bible with ribbed spine, recessed and embossed gilt embellished cartouche to front, four very ornate pierced and engraved gilt brass corners with red leather inserts behind to accent the piercing, and closed with two ornately engraved brass clasps. Page edges are also beautifully gilt. 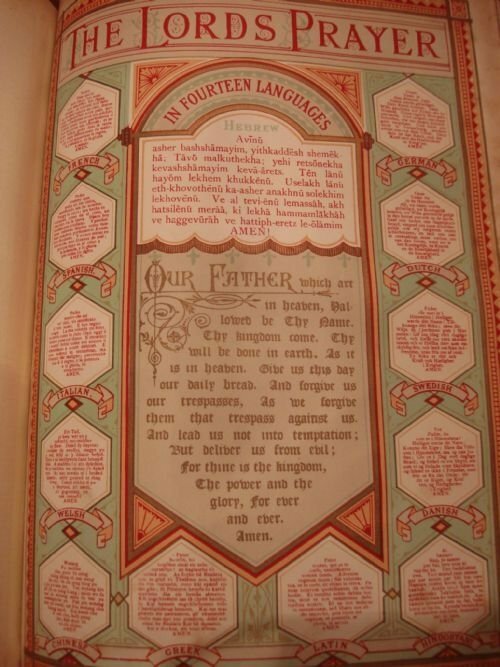 Approximately 1250 pages including both coloured and black and white plates, biblical scenes and maps, an illuminated title page, and a coloured plate of the Our Father prayer in 14 languages. Also, a portrait album (without portraits), and family register. Condition is very good, with only some foxing to some pages. 10.5 inches wide by 13.25 inches high, by 3.25 inches deep. Binding, clasps and corners are all tight and secure. A lovely and collectable bible to use or display. The unusually beautiful heavy embossed leather and ornate gilt brass binding makes a wonderful presentation. 1872-English very large antique leather bound embossed leather unique family bible. 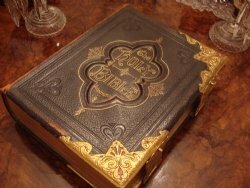 1872-antique very large embossed and gilt English leather King James version folio sized family bible, the property of Augustus Robert and Ellen Goff (nee Goodchild) who married in High Wycombe in 1871. Tightly bound in full black calf with both blind and gold stamped elaborate decoration to boards and hubbed spine. 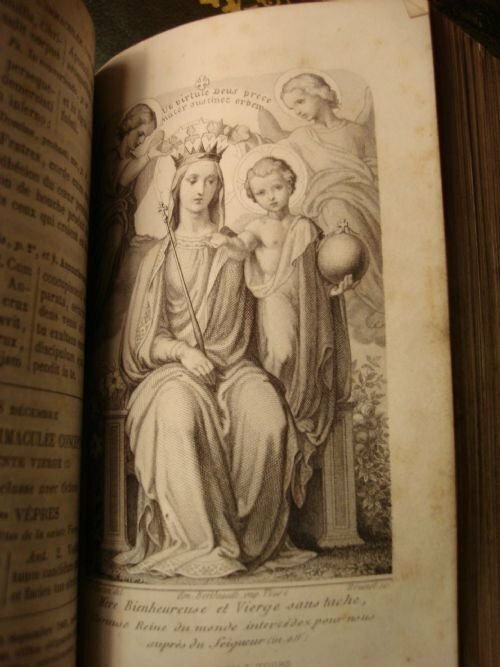 The Universal Family Bible with with explanatory notes and references from Henry, Brown, Scott, Kitto, Clarke and Co.
With some colour illustrated pages, and numerous high quality finely engraved black and white plates, and including a handwritten family registry. Leather book plate with owner's names to inside cover (increases collector interest and therefore value), marbled end papers to front and back, and lovely patinated gilt edges to pages. With ribbon page marker. Some minimal foxing and fingerprints to some pages. Front and back leather covers are decorated in the same ornate manner. 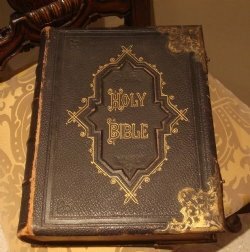 A very unique and impressive large antique family bible to use or display. Very readable. Size-15.75 inches long by 12 inches wide by 4.5 inches deep. Circa 1896 English antique leather and brass bound family bible by John Eadie. "Holy Bible: The National Comprehensive Family Bible, with the commentaries of Scott and Henry, and containing also many thousand critical and explanatory notes selected from the great authors of Europe and America. The commentaries condensed, and the whole edited by the late Rev. John Eadie, D.D., LL.D." 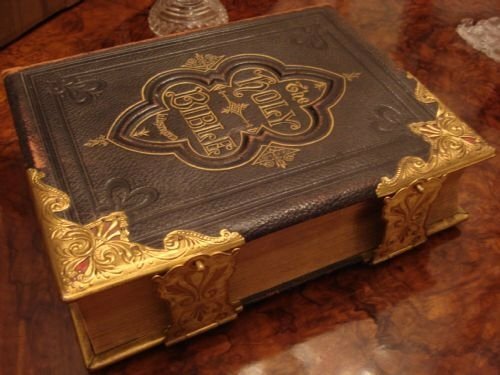 A large heavy embossed and gilded English leather bound family bible with ribbed spine, recessed embossed cartouche to front , four pierced and engraved brass corners, and closed with pierced and engraved brass clasps. Page edges are also nicely gilt. Owned by Nataniel Bishop and Louisa Sanford Bishop, who married in Brighton in 1896. 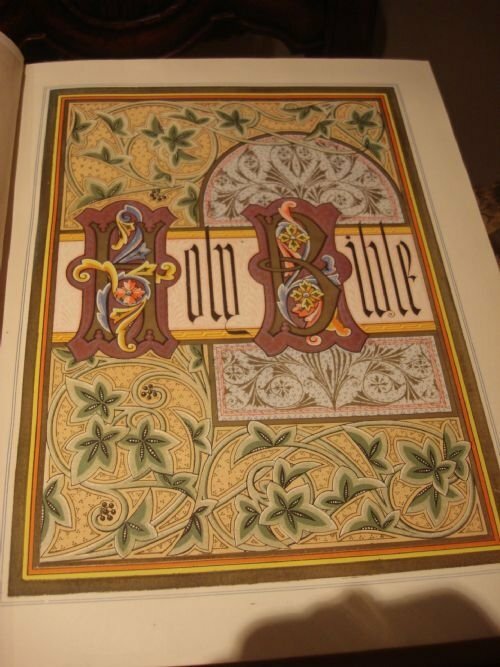 Approximately 1250 pages including coloured and black and white illustrations, and illuminated title page. Condition is very good, with only some rubbing to spine, and some staining to end pages only. A really lovely and collectable bible to use or to display. 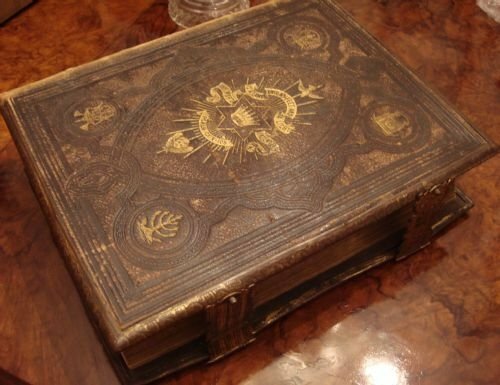 A large heavy embossed and gilded English leather bound family bible with ribbed spine, recessed and embossed cartouche to front , four pierced and engraved brass corners, and closed with two pierced and engraved brass clasps. Page edges are also beautifully gilt. 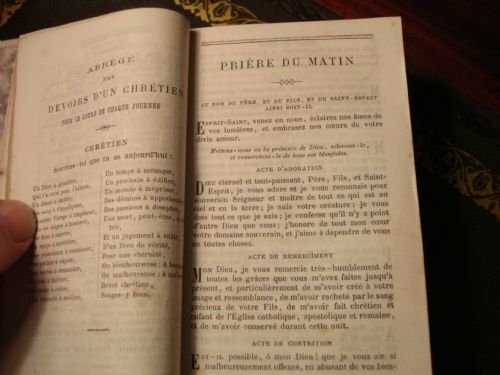 Approximately 1250 pages including both coloured and black and white plates, and an illuminated title page, and a coloured plate of the Our Father prayer in 14 languages. Condition is very good, with only some rubbing to the leather spine, and slight foxing to one end page only. 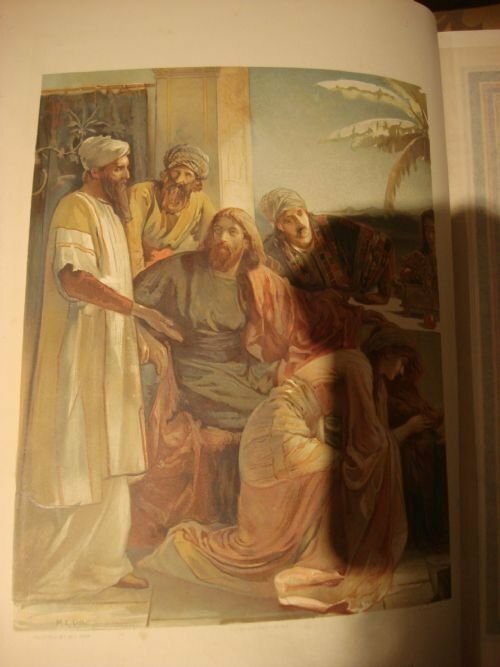 A lovely and collectable bible to use or display. 19th century large Brown's Self Interpreting family bible. Large leather bound and gilt metal embellished English copy of Brown's Self Interpreting family bible, approximately 1300 pages, with brass clasps and edge trim, published by Adam and Co. of Newcastle-on-Tyne. 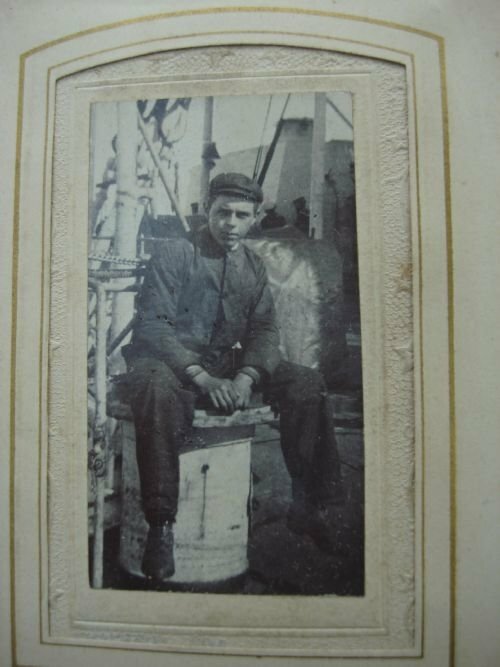 It has a hand written name and date inside the front cover, "Joseph Hall, his book, 1872." Inside, there is a hand written family register of births, deaths, marriages, and children's names. 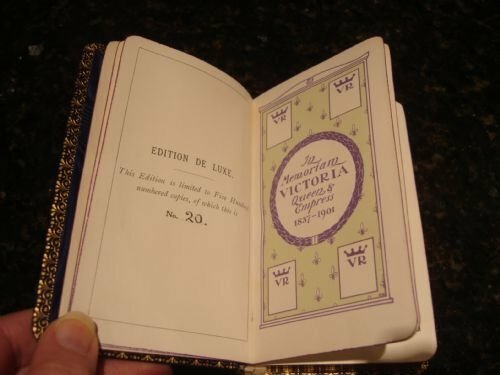 It shows that the original owner was 21 years old when he personalised the book. He married the following year, and died in 1921 at age 70. This copy of the old and new testaments by Rev. 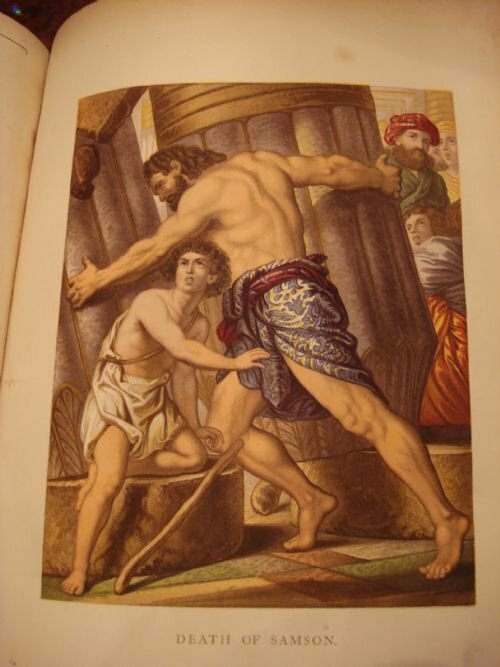 John Brown is nicely illustrated with an illuminated title page, many coloured plates, and biblical illustrations. The full leather binding with ribbed spine, has lovely embossed and gilt illustrations from a psalm on both sides. The paper page edges are gilded. 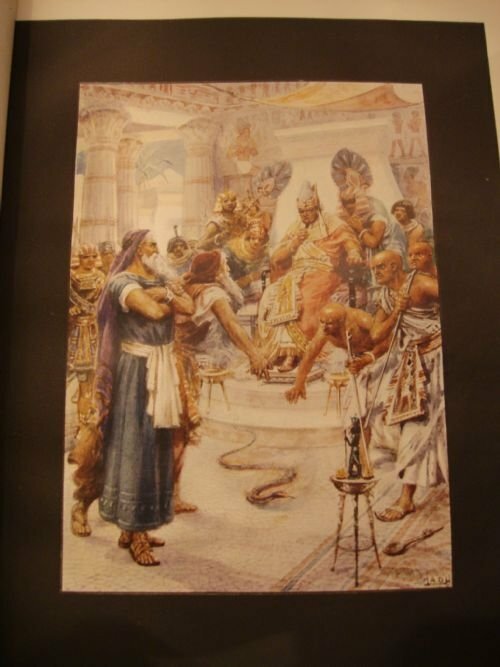 It is a more unusual edition of the bible than the ones usually found. Condition is good, with all pages and binding tight and intact. 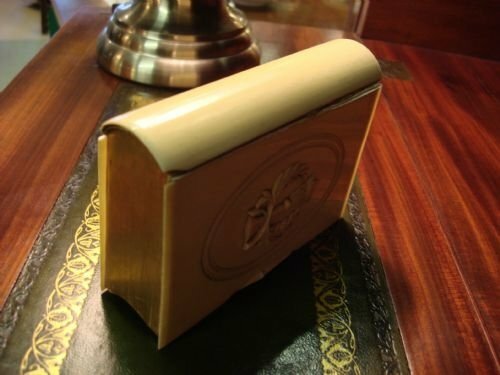 The leather is a bit faded in colour, there is foxing to pages, and the brass trim has lost some of the original gilding, and is a bit wavy on the back edges. It has been a much treasured family bible. Size-13.5 inches long by 11 inches wide by 4 inches deep. A very nice bible to use or display. 1863-English leather bound antique family bible. Antique embossed leather bound "The Holy Bible containing the old and new testaments translated out of the original tongues and with the former translations diligently compared and revised. By his majesty's special command." 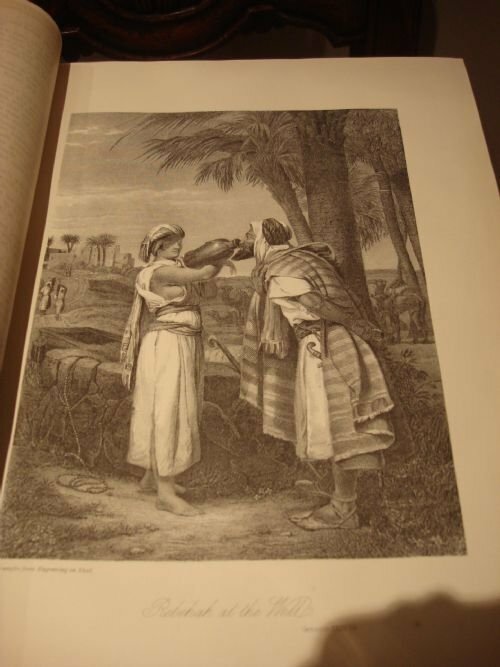 Printed by George E. Eyre and William Spottiswoode in London for the British and Foreign Bible Society. Size 9 inches wide by 11.5 inches high by 2.5 inches deep. There is some rubbing to leather binding edges, and a paint smear to back cover, and some foxing to end papers. Otherwise in very good condition, with tight binding and gilt page edges, an attractive antique bible to use or display. 1846-The Holy Bible, English leather bound bible closed with silver plate clasp. 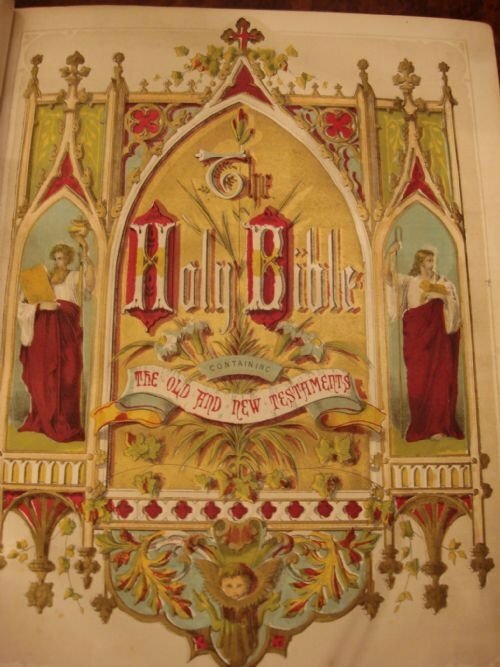 Published in 1846, an English leather bound copy of The Holy Bible, with beautifully patinated gilt page edges, and with silver plated closure, given to Mary Rye from Captain and Mrs. Randolph in 1847. Contains the old and new testaments, and family notations to end papers. Published by The University Press, Oxford. Some rubbing to the leather, and foxing to end papers only. With tight clasp and binding. Size 6 inches wide by 9 inches long by 2.5 inches deep. A very nice bible in very good condition, to use, or to display. 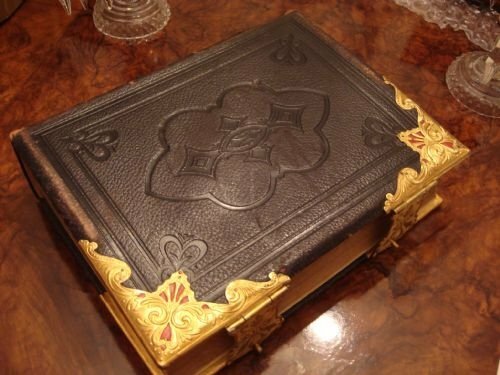 Dated 1882 Victorian embossed leather picture album with gilt metal clasp and embellishment. Dated approximately 1882, a lovely embossed leather Victorian picture album with gilt edges, gilt metal clasp, and numerous period pictures to interior. Size-6.25 inches long by 5.5 inches wide by 2.5 inches high. Condition of the exterior is excellent. Interior pages are loosening from the binding, due to fraying of the silk binding, and will need repair, if this will be used as an album. This contains 24 photos, a great value for the photos alone! A very nice example to use or display as a decorative accent on a table or desk. 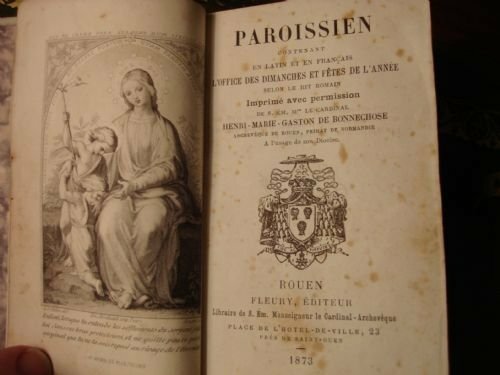 1873, made in Rouen, France, a carved ivory bound Paroissien or prayer book. Made in 1873 in Rouen, France, a Paroissien, an unusual carved ivory bound prayer book or missal for Sunday mass, devotional exercises and holy days. The pages have gilt edges. With 871 pages total, and a number of black and white plates, it has a relief carving on the front cover of a communion chalice and host, surrounded by leaves, within an oval frame. In good condition, the cover is completely bound in ivory on both sides and spine. It is slightly loose but intact. The end pages are marbled paper. The top portion of the gilded clasp is missing. There is also foxing to some pages. Likely to have been a gift for a First Holy Communion, this is a very attractive and unusual item, and an excellent value. Size-4 7/8 inches high by 3.5 inches wide by 1 3/8 inches deep. A very charming book, with wonderful colour and patina. It will be lovely to either use or display on desk or table.